Yesterday, we had the pleasure of meeting the President of EXP Realty, Vikki Bartholomae, at a lunch and learn event for new prospects. There were some really exciting things that she shared with us about the direction of the company, and we will be sharing many of these things here in the coming days. Today, though, we will focus on what we learned about the EXP Realty stock. One thing she clarified, which I had not realized before, is the the realty side of the operation is only one arm of the parent company, EXP World Holdings, Inc. This is an important distinction – and also an exciting one – because there is an incredible opportunity for growth. The parent company can expand into other aspects of the real estate industry over time, and you have a chance to share in that growth at a discounted rate! If you are agent or broker with the company, you have the option to use five percent (5%) of your commission from each closing to purchase EXP Realty stock at a discount of twenty percent (20%) off the average closing price for the last thirty days. Assuming you have not capped, your share of the total commission would be around $6,000. From that cut, you could choose to allocate up to $300 to purchase stock. 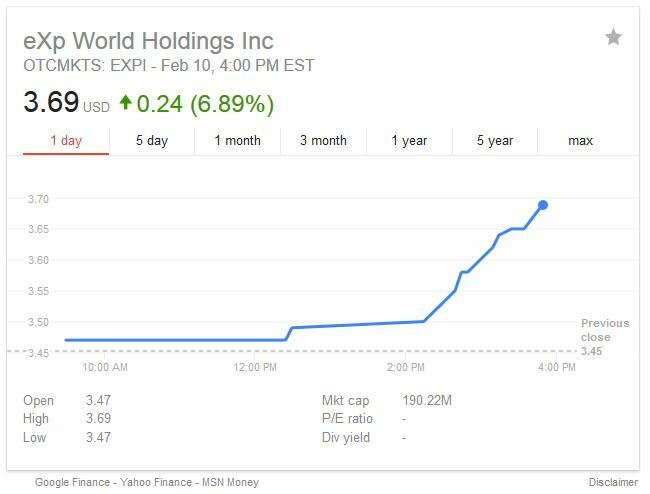 The closing price of the EXP World Holdings Inc stock (EXPI) yesterday was $3.69. Note: That was an increase of 6.89% over the opening price of $3.47. The average price over the last 30 days was $3.4665. At that price plus the 20% discount, you would be able to purchase 108 shares of EXPI. Those shares would be worth $398.52, but you would have paid a little less than $300 for them. Because of the fact you are purchasing the EXP Realty stocks at a discount, there are some rules about the steps you would have to take if you wanted to sell those shares. But that’s not really the point. Rather than paying the royalties and desk fees you’re probably accustomed to paying with your current brokerage, you can now use that money to add long-term wealth and build a nest egg for retirement. That is an amazing thing for most salespeople in the industry, because, to my knowledge, we’ve never had a benefit like this before. EXP Realty stock options are so unique within the industry that it is going to take a little time for most Realtors and brokers to see the value, but once they do, this company is going to explode. You have the opportunity to get in now and capitalize on that growth potential while the company is still young. If you would like to know more about the company, please contact us via the landing page here. Also, ask about our Explode My Down Line program that is designed to be another way for agents and brokers to build long-term, passive income. Disclaimer: I am not a stock adviser nor an expert on picking stocks, so please do not mistake anything I am writing here as financial advice. This is simply an effort to explain how the stock options work with EXP World Holdings Inc, and nothing more. I am a Realtor at the company, and I am only sharing my thoughts on the uniqueness of the way this brokerage is structured. Speak with a qualified financial adviser if you have any questions about the value of the stock.